In the past 15 months, Fairuza Sulemana has learned how to farm. True, for years she’s grown groundnuts to sell to other women and supplement nutrition for her own family, and she’s worked alongside her husband who grows crops for commercial sale on a large plot of land in Ghana’s Northern Region. She’s no stranger to agricultural work, but never before has she considered it a valid – and valued – income-generating occupation of her own. 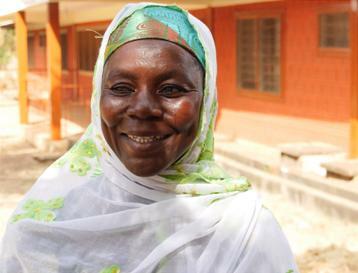 These days, thanks to the CHANGE (Climate Change Adaptation in Northern Ghana Enhanced) project, Fairuza is now the leader of a farmer-based organization (FBO) in Zoosali. Her group, comprised of 32 women and eight men, is one of 112 new FBOs established in 17 communities in Ghana’s Northern, Upper East and Upper West Regions. Fairuza now has more say over what she plants, when and how, and inspires other farmers—primarily women like her who previously cultivated crops only for their own household use, but now earn livelihoods from them—to do the same. The women of Zoosali and four other nearby communities have brought four types of indigenous seeds back from the brink of extinction, including the Bambara beans that Fairuza and many of her fellow farmers prefer. They’ve learned techniques to maximize crop yields despite the ravages of climate change in northern Ghana, where 85% of the population relies on smallholder farming for livelihoods, and where unreliable rains, drought and flooding, deforestation and dramatic loss of soil fertility are causing widespread food insecurity, hunger, and growing rates of malnutrition among children. Women, with their joint dependency on the land for food and income and on their husbands for access to land and the products from it, are especially vulnerable to the impacts of climate change – and therefore specifically targeted by CHANGE for interventions. The gender composition of Fairuza’s FBO is no accident. The new FBOs have a goal of increasing participation by women, and achieving gender parity in leadership roles. The same is true of the climate-smart agricultural training, a central component of the program. CHANGE’s technical partner, the Savannah Agricultural Research Institute, has trained a team of 12 Ministry of Food and Agriculture (MoFA) agricultural extension agents and 17 community extension agents (again, with a focus on increasing women’s involvement) to deliver stepped-down training in climate-smart agricultural practices across the regions. Radio broadcasts of the same information, with local weather forecasts and market prices, extend CHANGE’s reach and relevance even further. 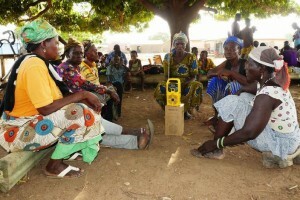 Radio listening groups bring timely information about weather, market prices and climate-smart agriculture to farmers. In Zoosali, Fairuza has attended each training, along with several learning sessions held by CFTC in the Northern Region’s capital, Tamale, to consolidate learning and ensure that women’s voices are heard at the planning and decision-making levels. “We have learned so much. We are using indigenous seeds and other climate-smart farming techniques that MoFA has taught us. Being part of CHANGE is increasing my capacity and ability to take care of my children,” said Fairuza at the most recent forum held on April 30, 2014. Climate-smart agriculture techniques are now in wider use throughout Ghana’s northern regions, like returning agricultural residue back to the soil after harvest instead of burning it, ploughing across the slope instead of with it, and planting, spacing and growing early-maturing, naturally drought-resistant varietals, tested on experimental plots in each community to gain early buy-in from farmers. These techniques are feeding the soil, as well as the families of the Upper East, Upper West and Northern Regions. And they are doing more: they are empowering women and improving their status in their communities.